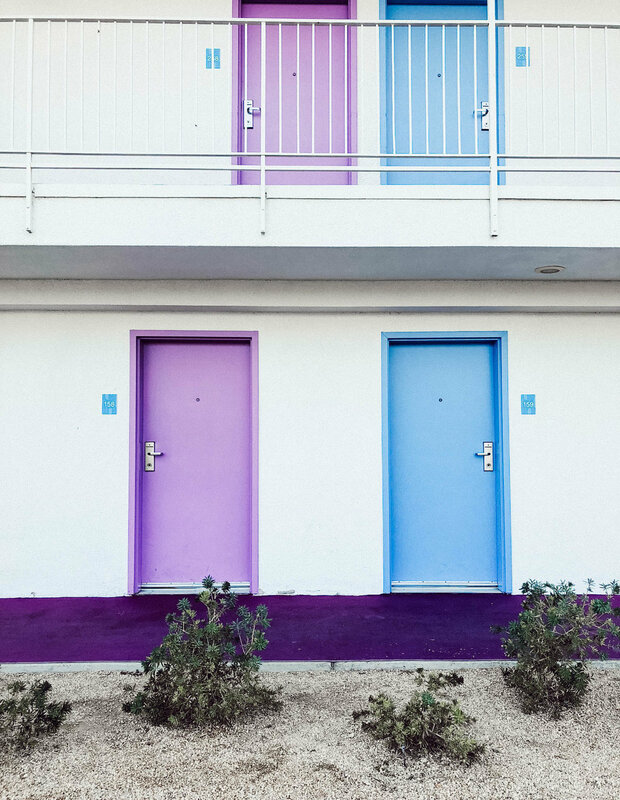 A few months back, I had the pleasure of visiting Palm Springs, easily one of my favorite places in the world after wrapping a work photoshoot in the Arizona desert. It was only a quick plane ride away from where I was staying in Tucson so I figured, what better way to spend a weekend than in a magical desert? 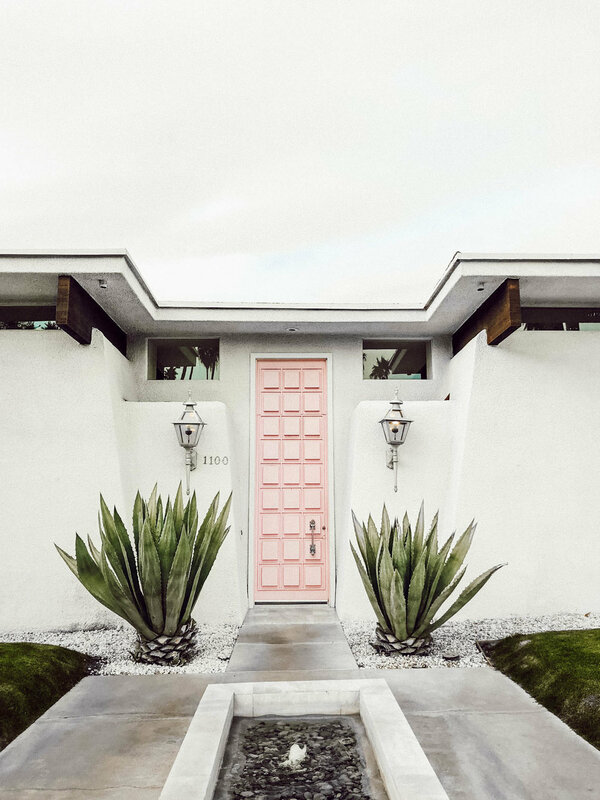 From Seattle, Palm Springs is about a 2.5 hour plane ride away, but if you’re even closer, definitely make this destination a priority! I arrived Saturday morning (the perks of catching an early morning flight) and left early Monday morning for work. I rented a car when I was there so I wasn’t spending a bunch of money on Ubers. I’d highly recommend having your own set of wheels to get around since a lot of the must-see sights walking distance from each other and if they are, it’s not fun to do in the heat. I would say this felt like a decent amount of time to see and do all I wanted to in the few days I was there, but if you have the opportunity to stay longer than a weekend, I would recommend doing so! 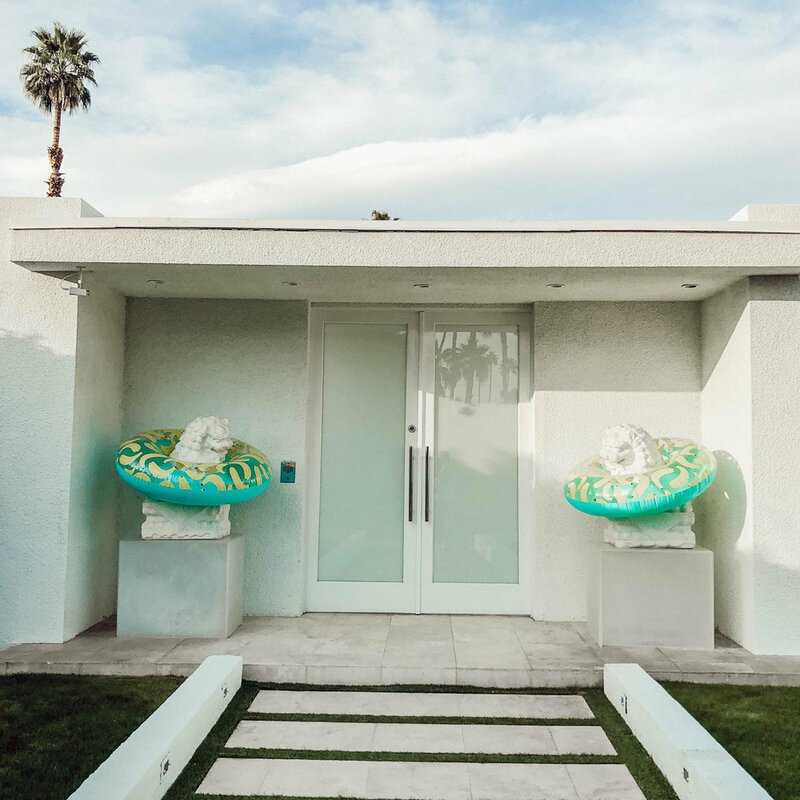 If you’re like me and are up for a challenge to see and do as much as possible on a weekend trip – then this weekend Palm Springs travel guide is for YOU! Also, if you’re a blogger like me, I’d highly recommend reaching out to a desert-based photographer before your trip if you want to capture photos in the desert while you’re down there! Brianna Broyles is my go-to Palm Springs girl and I felt so fortunate to meet up with her when I was down there to shoot some photos for my blog. I was lucky enough to be down in the desert the same time as one of my besties, Kami who is a San Diego-based photographer and we were able to grab lunch and shoot photos, too! Below I’ve called out my trip highlights: where I stayed during my trip, my favorite sights to see and recommended food spots. 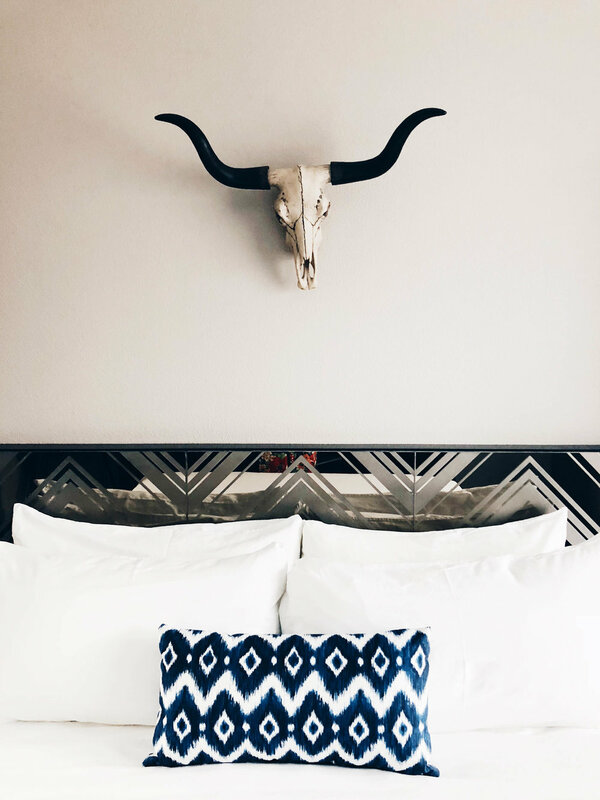 Where to stay: V Palm Springs | 333 E Palm Canyon Dr.
A big shout-out to V Palm Springs for hosting me! My room was the perfect size for a weekend trip and ideal for 1 person, 2 max. If you’re looking for a quiet retreat, this is probably not the hotel for you. A DJ was playing fairly loud music poolside on the weekends (at least, the weekend I was there) but I didn’t mind it. The hotel has a pool and a hot tub as well as a poolside bar and plenty of lounge chairs to get your tan on. Since I was on the go my entire trip, I really didn’t have much time to hang by the pool. The hotel’s location is super convenient – close to everything I wanted to see and do around town. 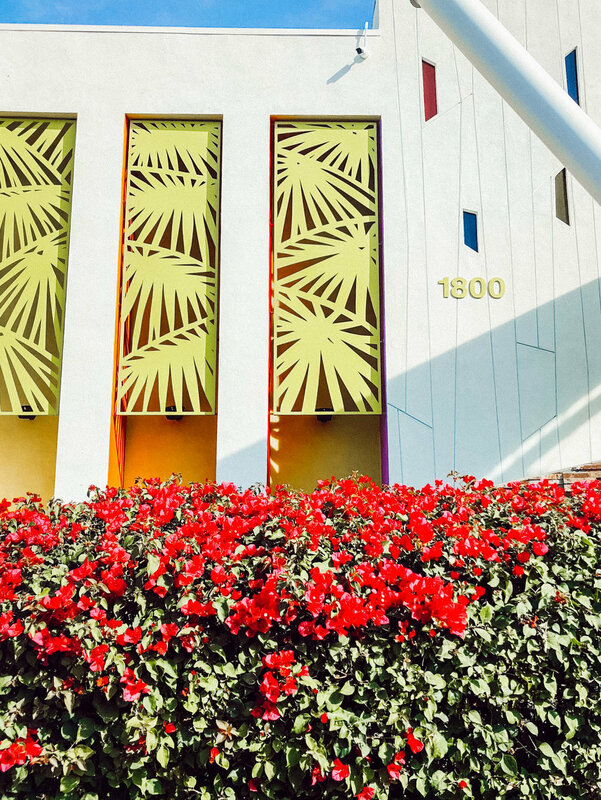 If you’re familiar with the ACE hotel and Moorten Botanical Gardens in Palm Springs, they are practically neighbors to this hotel! 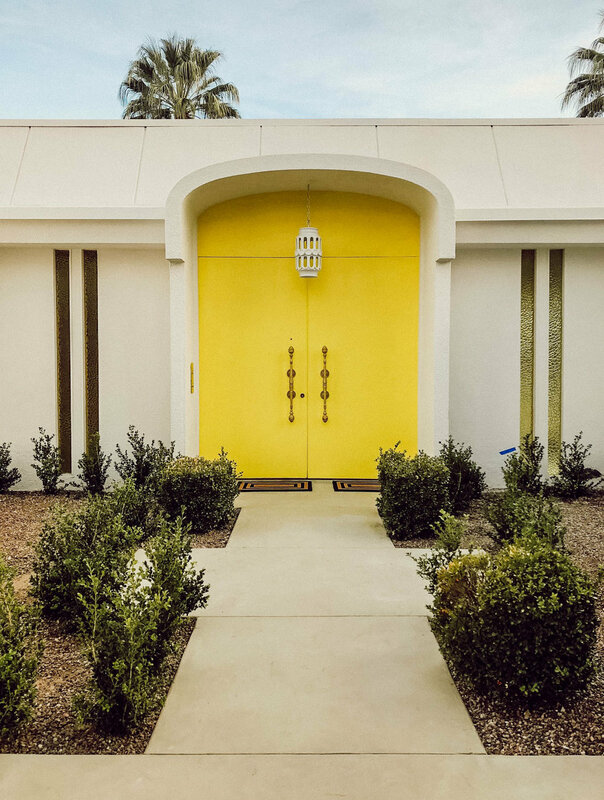 Palm Springs Door Tour: A must-see if you’re in the desert! Because I had a car, I was able to drive Kami and I around to all of the fun doors based on this Door Tour map (thanks to Salty Canary). 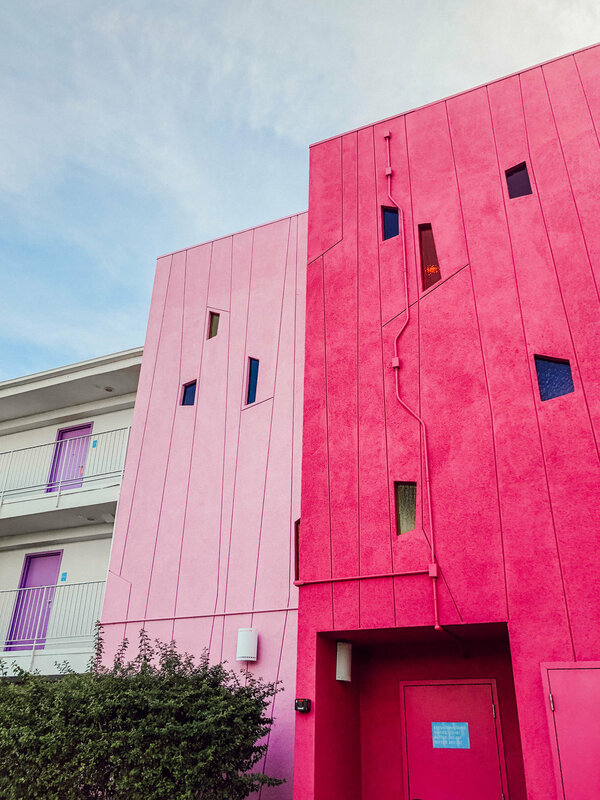 You can’t go to the desert without visiting #THATPINKDOOR and so many others in the various neighborhoods. Rule of thumb when visiting the doors: be respectful, these are people’s homes! 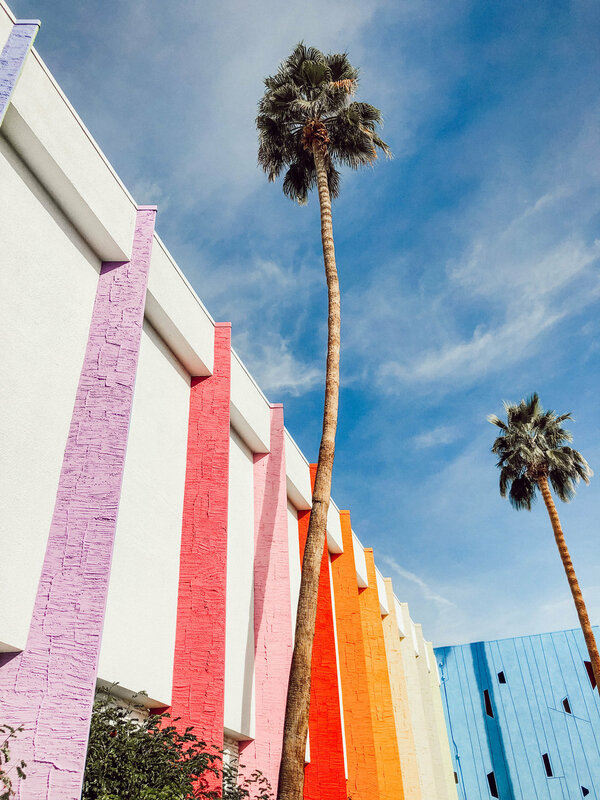 Check out the Saguaro Palm Springs: This colorful hotel is a can’t-miss. I didn’t stay at the Saguaro (1800 E Palm Canyon Dr) during my stay, but because it was so close to my hotel, I decided to pop over and take photos of the exterior. I’ve also heard great things about their restaurant: inside that serves tacos, I’ll be checking that out next time! Palm Canyon Drive / Downtown: Along the main strip of downtown are so many different shops to pop in and out of. It’s also a great strategy on super-hot days! 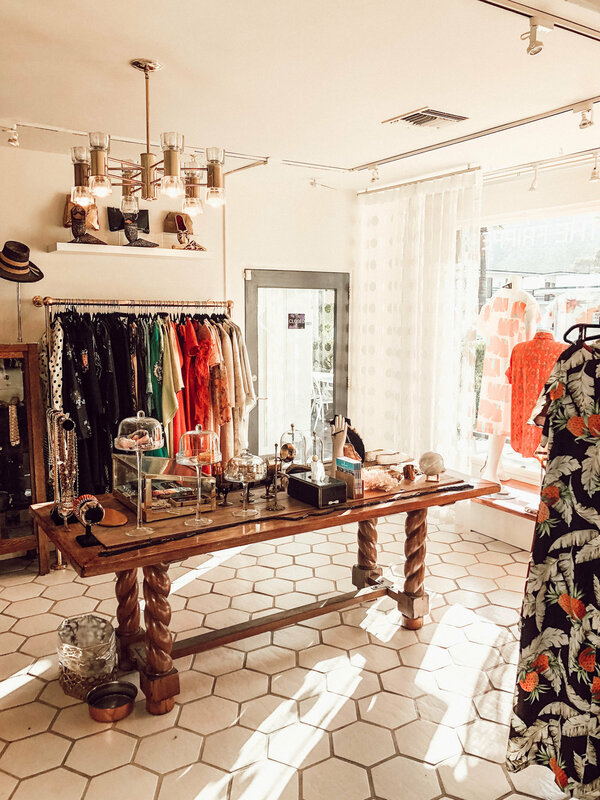 I loved visiting vintage shops and bright, beautiful boutiques. Norma’s at The Parker: Speaking of The Parker, Norma’s was by far my favorite brunch I’ve ever had in Palm Springs. I ordered a mimosa, the donuts and eggs benedict and was SO FULL I didn’t even need to eat lunch. I sat at the outdoor patio which was incredibly scenic amongst the colorful canopy, lanterns and foliage. If you’re going on a weekend, I highly recommend a reservation! A must-visit when you’re in the desert. King’s Highway/ ACE hotel for brunch: On my first day (Saturday) I met up with Kami and her friend Andie for brunch at the ACE (701 E Palm Canyon Dr). 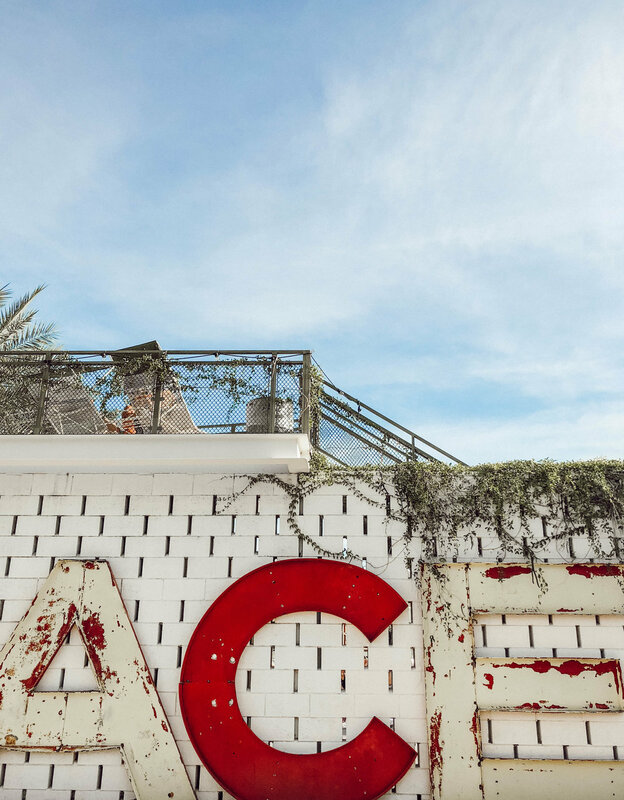 I’d actually never stepped foot inside or outside the ACE during my stay at Palm Springs so we had fun shooting on the grounds before dining near the pool at King’s Highway. The food was delicious as was my smoothie cocktail. It was also a great place to sight-see as it was jam-packed on the weekend! A reservation is also highly encouraged at this spot. Grab ice cream: If you need a sweet treat to fight off the heat and just love photogenic places, don’t forget to stop by Ice Cream & Shoppe (1551 N Palm Canyon Dr). The ice cream is delicious and the store itself is so cute, you just have to go see it for yourself and do it for the ‘gram!